This upgrade page contains details of the latest release version. You can also check out CrazyTalk 7 What's New page for more info. Available below are upgrade patches and packs to ensure you have the latest version of CrazyTalk product installed. A version history is included so you can better understand the new features added or issues solved within a specific release. Last update on 15th July 2014. CrazyTalk 7 can run alongside with CrazyTalk4,5,6. 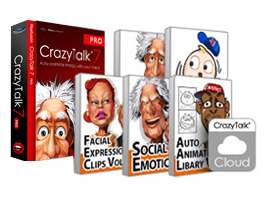 You can install CrazyTalk 7 trial or full version without removing CrazyTalk4,5,6 program from your system. CrazyTalk 7 is NOT compatible with current iClone versions. Fixed: Crash problem on pasted viseme clips. .
Added: Compatible with CrazyTalk Interactive Plug-in. Fixed: Added a sample rate and sample size box combo for audio recorded automatically stop working issue. Fixed: German TTS could not modify the pitch bar issue. Fixed: Invalid number installer program. Enhanced: Puppet profile eyeball turning. Enhanced: Content library content for improved human photo realism. Enhanced: New library of human eyes including more natural templates for Caucasian and Asian eyes. Enhanced: New library of human teeth, including more natural teeth shapes. Added: Two real human actors, one male and one female for photo fitting references. Added: Two idle animations, one male and one female for optimal human idle behaviors. Added: Able to save custom idle animations for optimal web and iPhone viewing experience. Added: Publish CrazyTalk projects to cloud and view them on web browsers and iOS devices. Added: Share CrazyTalk projects to Facebook, Twitter, Google+, Blogger, Tumblr, or paste URL quick sharing through email, message apps, and web pages. Added: Paid product users can access the CrazyTalk Member Cloud for project management - rename, edit title, description, delete, and update projects. Fixed: SSL Handshake failed while uploading project to cloud server. Fixed: Multi-audio, Auto Motion had no reaction in Body movement parts. Fixed: Motion Clips created with the Face Puppet - after breaking had extra keys inside the Face track. Fixed: MP4 codec activation Error. Fixed: Crashes during mask editing due to modified image size. Fixed: Transparent background output issue with web avatar. Fixed: Bug that caused CrazyTalk to crash when outputed in the smallest cropped area. Enhanced: Improved Text-To-Speech engine quality for voices in 16kHz. Fixed: The real-time speed when operating software in stage mode. Fixed: Upload option for YouTube publishing. Fixed: SFX export sizes differing between CrazyTalk editing on stage and final export. Fixed: Idle motion speeds on stage and final export; they are now identical speeds. Fixed: When users set a key between two keys, the original animation would sometimes lose its blend effect. Fixed: The published web avatar wouldn’t display normally in Firefox. Fixed: The fade-in and fade-out function wouldn’t operate normally. Fixed: If a user inputted text into a tag column, it might have failed to directly upload to YouTube (the tag column is also removed now). Added: Crop function for export. Added: Specify the range of the video with mark points in play bar to be exported. Added: Be able to set the color of the background border. Added: Be able to customize the idle motion of your avatar. Added: Use hot keys to turn on/off the idle mode. Enhanced: Web Avatar output with transparent background. Added: Multi-head setup with fitting tools to identify up to 4 heads in any image. Added: Dynamic dialogue with multi-character editing tracks in Stage Feature. Added: Camera system with zooming in/out for flexibly arranging the scene. Added: 3D Face Orientation setting enables precise fitting for slight head turns. Added: Add Character Frame to animate (move, rotate, scale) the full character in Timeline Editor. Added: 4 layers of VividEye effects: adjustment of eyeballs, optics, eye shadow and eyelashes. Added: Match your character style with VividEye Templates – anime, animal, cartoon, comic, human. Added: EyeMagic adds various cosmetic effects with adjustable colors and lash sizes, style controls. Added: Interactive Flash Web Avatar – able to follow the mouse cursor, with custom model and script for output. Added: Export for web (Interactive Flash Avatar/Widget) – export transparent-background Avatar Widgets for WidgetMe and WidgetCast. Enhanced: The additional layer of hair mesh provides the accurate fitting, enabling the natural movement of characters with large hair, a hat and ears. Enhanced: Auto human face fitting engine simplifies the face fitting procedures. Enhanced: More selections of Idle animations in different moods. Enhanced: Open GL hardware acceleration for performance. Enhanced: Direct output to YouTube. Fixed: Cannot launch CrazyTalk in some conditions. Fixed: Program crashes when the Model button is clicked in some conditions. Removed: TWAIN device input function. Fixed: TTS does not work properly after clicking "add"
Added: One click access to "Kodak PhotoNet"
For those of you who always need to be on the cutting edge, we’re offering early access to pre-released patches for CrazyTalk 7 before they’ve gone through the approval process from Apple. Keep in mind that there is a small chance these patches may be unstable, however if you’d like to be the first to try out the newest patches, please download here. If you would prefer to use the official version approved by Apple, then simply update your CrazyTalk 7 from the Mac App Store. We suggest that you use the latest version, and if you encounter any issues you can always resume using previous versions. We strongly recommend that you choose from the update methods below and follow the instructions listed. Since each method follows a different update procedure, we suggest that you consistently use a single update method in order to avoid confusion and accidental loss of your content library. 1. Update from Mac App Store: Every update will overwrite the previous version and content library. You will need to keep a copy of your content data for future retrieval. 2. Update from Reallusion with early access patches: You can directly download the latest patch, and you can retrieve the past bonus content you have downloaded from your Reallusion Member Page. *How to re-download Bonus Pack? *If you wish to update the software from the Mac Store version, you simply need to delete CrazyTalk 7, and then re-install the version from the Mac Store. Last update on June 10th 2015. Fixed: Crash problem when exporting project as a video. Fixed: 7.12.1505.1 failed to support OSX 10.6.8. Fixed: 7.12.1505.1 failed to login as a Reallusion member. Fixed: Users were not able to install CrazyTalk 7 Mac version due to a Machine Key issue. Fixed: Users were not able to launch CrazyTalk 7 -3D View Failed, due to case-senstive hard disk format. For JPEG, ProRes codecs, OSX 10.7.5 above is required. Added: Program UI localization support (Japanese and German language). To switch the language for CrazyTalk 7, please go to Set System Preferences > Language & Text and then set the region to Japan or Germany. Fixed: Some video exports displayed audio without a video update. Fixed: Some Mac models with AMD Radeon HD 6630M or ATI Radeon HD 5750 graphic cards caused Eyes/Teeth setting preview window to be distorted or turn white. Fixed: Crash issues with Eye/Teeth settings. Fixed: Speed slider issues with certain TTS voices inside the TTS Editor panel. Fixed: Issues with initial crash error message "Failed to initialize 3D view. Fixed: Export with H.264 codec; two new options added: ProRes 4444 codec and ProRes 422. Added: Video Export with Alpha Chanel (transparent video) when exporting in ProRes 4444 codec. This is a great new feature that can help overlay transparent-background videos on most Mac apps like Keynote or other video editing tools. Fixed: Issues during login process. Resumed the original login process where users create an account and login from the Reallusion website. Fixed: Cannot find the Bonus Pack files in the Content Manager or load them in the program after downloading. Users may login in the member page to download the fixed Bonus Pack here. Fixed: Crash issues with Save as Project from File Menu. Users are now able to save their project files in the default save folder. Fixed: Issues with TTS Speed not being correct. Users may use additional TTS voices from the Apple server now. Fixed: Issues with Timeline lips editing. Failure to move or copy lip shape keys under certain conditions. Fixed: Issues with viewport camera in 3D profile setting page (orthographic to perspective). Now it has a consistent look as in the main character window. Fixed: Initial crash caused by OS language set as non-English language. Added: Time markers to determine playback and export range. Added: Being able to determine the depth level of a 3D Face profile. Added: Being able to use multi-language TTS voices. Added: Modifications to the Help Menu for linking to Manual and Video Tutorials.